This pine is in the same stand as the birches in the previous post. 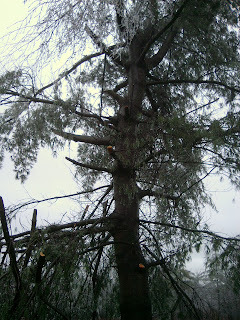 It didn't fare as well - all the broken limbs you see are new breaks. Again, this was not much damage compared to a lot of the region. 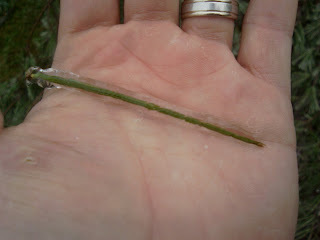 Needle from the pine tree, encased in ice. Actually, this was a cluster of three needles. 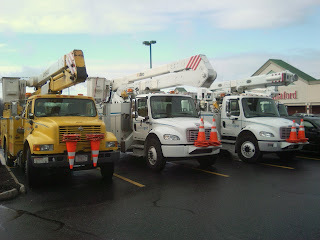 Power-company trucks in the parking lot at lunch Friday. There were 9 or 10 of these large trucks at midday Monday. 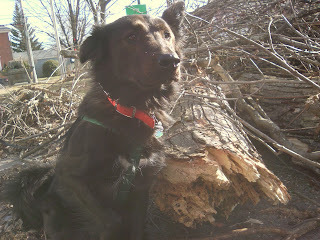 One of two large limbs that came out of the old oak down the block. And Jolly providing scale :).